A herbarium is a permanent, catalogued collection of preserved plant specimens. Specimens in herbaria are typically organized taxonomically in tall, airtight, metal cabinets and have many uses: taxonomic verification, geographic range estimates, biodiversity estimates, and climate change assessment are just a few! The herbarium at Plymouth State University contains mostly historic collections by E. J. Hehre and many others. The herbarium currently consists of three full cabinets (Angiosperms) and six half-cabinets (Algae to Gymnosperms! ), but will nearly double when two, large collections (recent donations) have been added. The herbarium will be indexed after preliminary digitization and once we’ve found a proper space for it. 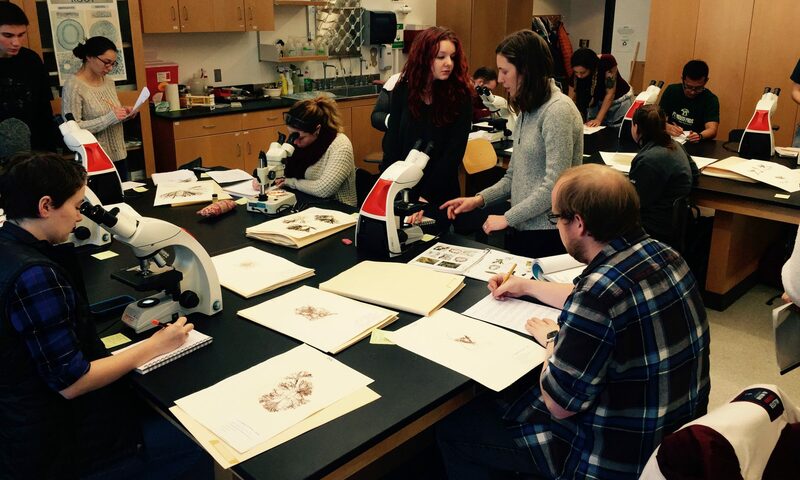 If you would like to use the herbarium, please contact Diana Jolles at 603-535-3320 or ddjolles@plymouth.edu to arrange a visit or request specimen information. If you are looking for specimens from New England for your work, consider using the Consortium of New England Herbaria (CNH). We are in the process of specimen inventory. As digitization begins, information about our holdings will be accessible here, but you can also follow us on Twitter @PSHerbarium! Aug 9. @PSHerbarium handle created to showcase herbarium collections and activities to the public. Feb 11. Updated and recorded taxonomy for 204 genera in 44 families (Angiosperms A through C), replaced damaged folders, inspected cabinets for pests and moisture damage. Feb 12. Recorded 90 more genera in 9 additional families (Angiosperms D through F). Feb 15. Added 41 more genera and 22 families! Feb 17. Added 121 additional genera from 31 more families. We are now through Oxalidaceae! May 10. Plymouth State University Herbarium officially registered as PSH, a curated collection of plant specimens for scientific research, in the Index Herbariorum. May 30. Two new cabinets purchased by PSU’s Center for the Environment and installed in Boyd Science Center to replace old wooden half-cabinets. June 3. Proposal to digitize PSH submitted an Integrated Cluster (IC) project proposal to PSU entitled, PSU herbarium digitization: Protecting our future by preserving our past. June 14. Erika Rydberg (digital librarian, Lamson Library) visits Harvard (HUH) to see their digitization equipment and workflow. June 27. Dr. Stoughton delivers a talk entitled, An adaptive prioritization system for digitizing small herbaria and alleviating plant blindness at the institutional level at the Botanical Society of America conference in Fort Worth, Texas. July 28. Integrated cluster project proposal to digitize PSH officially denied funding by review committee. Aug 8. Seven herbarium cabinets moved from Keene State College to Plymouth State University. Cabinets stored under awning outside Sam Reed Hall. Jan 18. Dr. Stoughton is awarded a small grant for his proposal “PSU herbarium digitization: Protecting our future by preserving our past” from Plymouth State University’s Research Advisory Council to begin barcoding PSH specimens in July 2018. May 3. Undergraduate Matt Treanor (Business major, biology minor) presents his research on PSH Angiosperm holdings at Plymouth State University’s annual Showcase of Excellence. Next, this poster will be presented at the Botanical Society of America conference in Rochester, MN.